The Brazilian banking system has a wide range of services for both private individuals and companies. The major retail banks have self-service ATM halls and most services available at the bank itself are also available via Internet banking. Brazilian banks offer current accounts, savings and investment accounts, credit and debit card services, personal loans and overdrafts, and foreign exchange services. On February 14th, 2013, Banco Central do Brasil published Circular No. 3,625, regulating the use of International Bank Account Number (IBAN) as a valid identification standard for international funds transfers to bank accounts kept in Brazil. The new standard was designed in an agreement with bankers’ associations in the country. 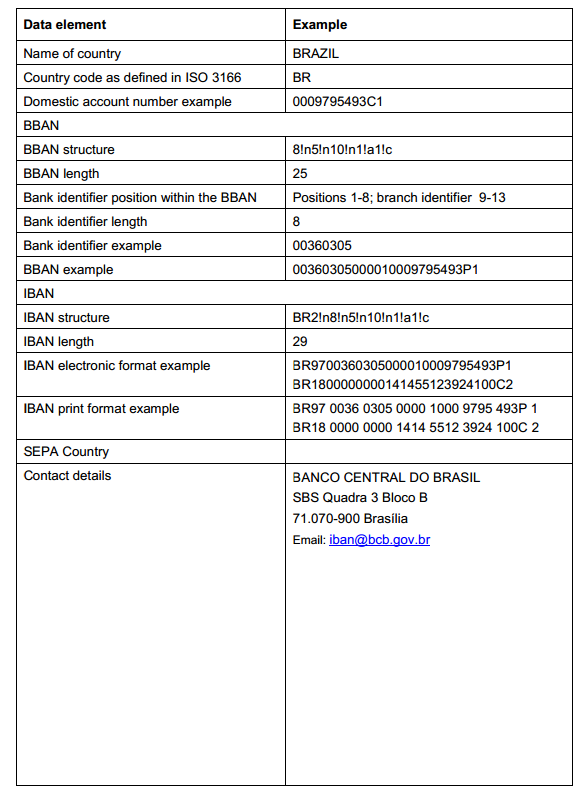 From july 2013 on, all brazilian financial institutions must provide their clients with the IBAN for their respective accounts, on their demand, and must accommodate all funds transfers received where IBAN is correctly used to identify a national bank account. codes is available at Banco Central do Brasil website. by adding leading zeros whenever necessary. Financial Institutions obligations: Generate and inform their clients their respective IBAN(s) Brazilian institutions must make IBAN available for their clients, by July 1st 2013 upon request. The real (pl. reais) is the present-day currency of Brazil. Its sign is R$ and its ISO code is BRL. It is subdivided into 100 centavos ("hundredths"). In Portuguese the word real means both "royal" and "real". The modern real was introduced in 1994, when it replaced the old currency, the cruzeiro real, as part of the Plano Real, a substantial monetary reform package that aimed to put an end to three decades of rampant inflation. At the time it was meant to have approximately fixed 1:1 exchange rate with the United States dollar. It suffered a sudden devaluation to a rate of about 2:1 in 1999, reached almost 4:1 in 2002, then partly recovered and has been approximately 2:1 since 2006. The exchange rate as of 16 November 2014 is BRL 2.60 to USD 1.00. The Brazilian banking system is very modern and stable and often transactions are done in real-time. Many global brands such as HSBC, Santander and Citibank have branch networks in most cities in Brazil. When you go abroad, always advise your bank and credit card operator that you are travelling to Brazil to avoid your card getting automatically blocked by their anti-fraud systems. It is normally possible to withdraw cash from ATM's from abroad at most domestic bank branches (e.g. Banco do Brasil, Bradesco, HSBC, Santander), at airports or 24-hour cash-machines ATMs (e.g. Banco 24 Horas) in shopping centres and petrol stations. If you intend to transfer larger amounts to or from Brazil (e.g. buying or selling property) you will need to declare it with the Central Bank and should take good professional advice to avoid potential tax charges in the future and look at a number of options to get the best exchange rates. Interest rates are very high in Brazil. Savings accounts usually earn interest at a rate of between ½ and 1% per month. Foreign currencies can be exchanged in shops with signs showing "Cambio". The exchange rates given for exchanging cash are generally better than those from withdrawing cash from a credit card from an ATM machine (especially with all of the little fees most card companies charge these days). Can foreigners open a bank account in Brazil as non resident? No, unless you are a Brazilian resident with permanent address and the required documents.